Remember the holiday nut encrusted cheese ball sitting majestically on a throne of Bibb lettuce and surrounded by crackers? It’s back and looking ever so hip with new flavor nuances. I like to ratch up the flavor with dried fruits like figs and apricots but cranberries, dates and dried pear would be nice too. I lighten the taste with mascarpone cheese instead of all cream cheese. This is the perfect holiday nibble and a cinch to make. Combine the cheeses, 1 tablespoon virgin olive oil, figs, apricots, cranberries, salt and nutmeg in a large bowl. Divide and scrape the mixture onto a large sheet of plastic wrap and with your hands form into a pine cone shape. Wrap and refrigerate for a couple of hours. Unwrap and brush each cheese with the remaining 1 tablespoon olive oil. 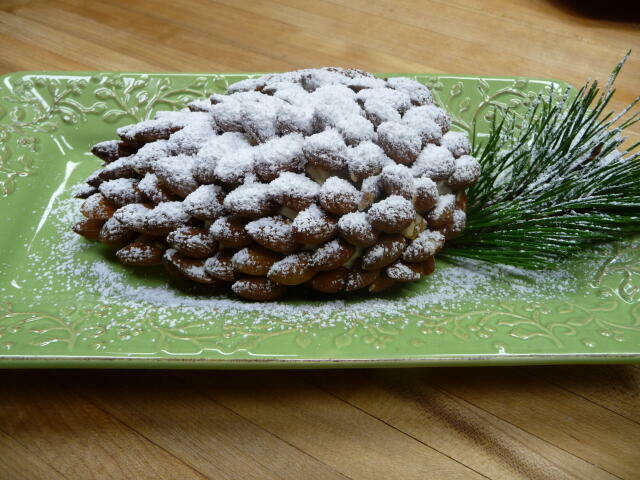 Press the almonds into the cheese, covering it completely and keeping the shape of a pine cone. Gently brush the nuts with the melted jelly. Use a small sieve and coat the top in confectioners sugar. Serve at room temperature with plain crackers. That is the most awesome looking cheese ball that I have ever seen! And, yes! It looks exactly like a snow dusted pine cone! I live in Idaho so I know what those look like! Thank you for the recipe and that photo! I'm making one this week!